The first sprites and portrait were made for the first DangerTerrorHorrorThon horror and monster-themed update of ScrollBoss. 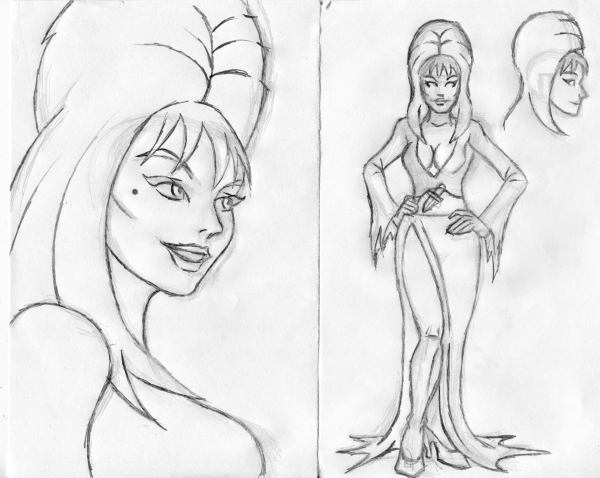 The main Elvira pose was based on a reference pic that I found a while ago, but can't find online now. I partially tried to match the Street Fighter Alpha 3 Vs. portrait style (mainly the face positioning, head shape and nose) while trying to still make it look a bit like Elvira. I tried to work in the smirk from on a site wallpaper here. I was trying to make her look sly and smart, but she wound up looking more cute than I intended. Honestly, Elvira is as fun to draw and sprite as she is to watch in hosting duties or in her own movies, so don't be surprised if I add more to this.